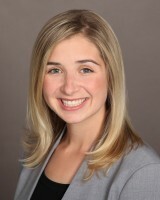 Seton Hill University Orthodontic Resident Dr. Lauren Busch is the recipient of the 2015 David C. Hamilton Orthodontic Research Award presented by The Pennsylvania Association of Orthodontists. The award, given to current graduate students or recent graduates of a Pennsylvania orthodontic program, furthers the Association’s mission of supporting continuing education and research at orthodontic programs in Pennsylvania. “Receiving the Hamilton Award validates the work my coworkers and I have been doing in orthodontic research and has provided me with the confidence to continue conducting research in my career,” said Busch. The David C. Hamilton Orthodontic Research award is named in honor of Dr. David C. Hamilton of New Castle, Pa., who was one of the original founders of the Pennsylvania Association of Orthodontists. He served as its President as well as President of the American Association of Orthodontists. He lectured around the world to orthodontic groups and graduate students. Dr. Busch, who will graduate in December 2015 from Seton Hill’s Orthodontics Program, is a graduate of the University of Michigan undergraduate school as well as the University of Michigan school of dentistry. A native of Ann Arbor, Mich., Busch’s initial interest in research came from her parents, both of whom are scientific researchers. After receiving her undergraduate degree in biology, Busch worked as a research assistant for Dr. James McNamara, a well-known orthodontist and researcher who teaches in the orthodontics program at the University of Michigan. Busch assisted Dr. McNamara as well as the late Dr. Tiziano Baccetti, an orthodontist and orthodontic researcher from Florence, Italy, on research they conducted into common orthodontic and orthopedic techniques while Dr. Baccetti served as a visiting professor at Michigan. Her role in the research would ultimately lead to her inclusion as an author on several scientific studies. “The opportunity to work with talented scientists was a wonderful introduction to orthodontics as well as orthodontic research that ultimately lead to my decision to continue in dental school,” Busch said. Busch, who met her husband, James Busch, a Ligonier, Pa. native during dental school, enrolled in Seton Hill’s orthodontics program after her dental school graduation in 2013. Dr. James Busch is a pediatric dentist who completed training for that specialty at the University of Pittsburgh in 2015. During her time at Seton Hill, Dr. Lauren Busch has continued conducting research, including projects with Dr. Rinchuse on the history of tooth extraction treatment, a project on uprighting impacted molars, a project with a fellow resident on African American perceptions of beauty and her master’s thesis using 3D scans to investigate how much bone surrounds the lower incisor prior to orthodontic treatment. She hopes this project will help clinicians better determine how much they can move individual teeth within a patient's jaw without any negative side-effects. The Seton Hill University Orthodontics Program combines advanced instruction in biomedical and clinical sciences with teaching, research and clinical experiences to prepare dental school graduates to provide the best orthodontic and dentofacial care according to standards established by the American Board of Orthodontics. Program residents, who have already earned a D.D.S. or D.M.D., complete a 30-month program to earn a master’s of science degree and certificate in orthodontics. The 21 residents in the program offer reduced-cost orthodontic care under the supervision of clinical faculty at the Seton Hill University Center for Orthodontics, located in the Bishop Connare Center at 2909 Seminary Drive, Greensburg, Pa.